Although it doesn't show up in the weekly averages yet, towards the end of the week I started meeting my goals of not eating any junk food, and also reaching my daily step count target of 10,000 steps/day (the weekly average was pulled down by doing practically no exercise on Tuesday). This week I plan on doing a five day stint of my version of Dr Longo's 'fasting mimicking diet' (basically trying to meet his daily targets for % fat/carb/protein without buying the commercial meal replacement kit that his research seems to be aimed at promoting). My DIY version of the FMD might not have the same effect of 'resetting' the immune system etc. as Dr Longo's medically supervised and highly regimented version, but it should still be quite beneficial simply to have a five-day stint of moderate caloric restriction with adequate nutition. On Saturday I bought a cheap 'fitbit' style activity tracker from Aldi for about $37 - I've tried it out and it seems to work pretty well so far, with the total daily step counts being very close to my estimates using a spreadsheet of known step counts for particular activities. On Saturday the total reading was ~3% less than the estimate based on my spreadsheet values (the graph below doesn't include ~900 steps I'd done prior to turning on the activity meter), and on Sunday it was ~9% lower (probably due to the activity meter not recording as many steps during my 1 hour squash session as the 'step equivalent' value I had used in my spreadsheet). So this will save me the trouble of having to record my activities during the day and then use a spreadsheet to estimate my daily total steps, and will also automatically include steps for any non-standard walking routes I decide to take. 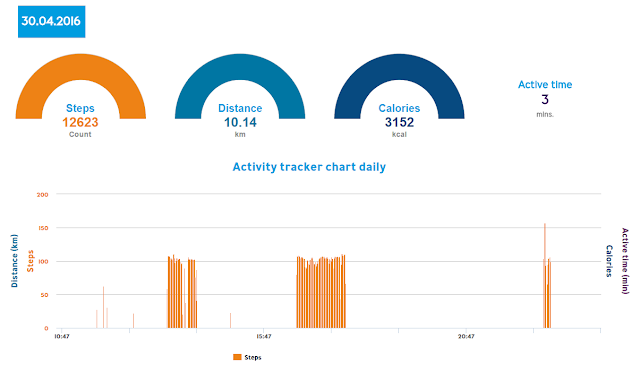 One interesting feature is that the activity meter plot shows the distribution of step activity during the day, rather than just a total step count. The graph clearly shows my active periods, where I went for a couple of short walks while the boys were doing their Judo training, then a long evening walk (half City2Surf distance) in the evening, and finally a brief session of jogging during my 5BX in the late evening. It will be interesting to see the graph for a workday, where I try to do a brief walk every hour at the office, plus a lunchtime and evening walk. The device also tracks the amount of 'active' time, but it seems to set the bar fairly high - on Saturday it only recorded three minutes of 'active' time (when I was jogging during the 5BX session), and on Sunday it only recorded two minutes of 'active' time during my hour of squash! Apparently a brisk walk doesn't count as 'active' time. The unit is rated to 'waterproof' to 30m (3 atmosphere pressure tested), but is really only 'splashproof' as the instructions recommend it NOT be taking swimming, diving or so on. I might risk wearing it while kayaking, although it may not count a paddle stroke as a 'step'. The activity meter seems to be good value for $37, with the only problems encountered so far are the need to disconnect and reconnect the device to my tablet via bluetooth every time I want to download data (once the device gets out of range of my tablet the bluetooth connection drops out, and doesn't seem to automatically reconnect). I'll also have to 'sync' the tablet data with cloud storage every so often, and once a week I'll need to remember to connect it to the USB adapter and recharge the battery (which is supposed to last ~10 days on a full charge). Hopefully this device will keep working for at least a year or two (it has a two year warranty, so I should be able to get a replacement if it stops working prematurely).